Time to tie a few Intruders? Think so. No point tying one of the pesty but highly effective Steelhead Intruders without taking a photo for the record, but it has been months since I’ve done any serious photography and consequently forgot most of what I barely learned the last session. Got things sort of set up and looked in the viewfinder. Hummmmmm. Something in the background? Yep, my dear orange cat Boomer just had to see what was going on up on the fly bench. I love this cat. Just do. The fly is nice too. Bet it will swing up a big buck this winter when the water greens up a little. I’ll probably fish black purple and blue first though. Hope the season is going well for everyone who reads this. I’m trying to decide on my next book project that will be the focus of my attention in January 2016. Second editions of Intruders? Sea-run cutthroat flies? Flyfishing Oregon? I have at least fifty new pages to add to the Book of Revelation. 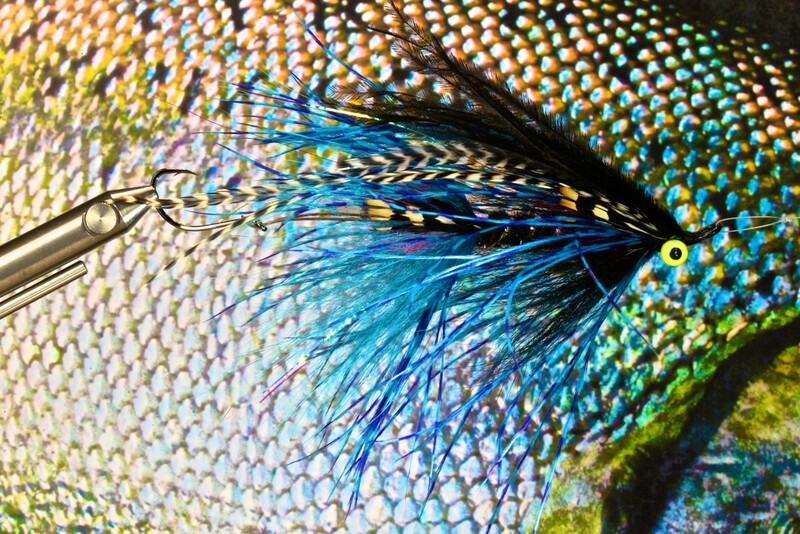 A new saltwater fly book? Don’t know. Think I’ll close with another Intruder. The latest edition of Flyfishing and Tying Journal (Winter 2016) has two articles written by my new/old friend Frank Amato. Long story short, Frank and I barely escaped meeting throughout our respective careers, not easy, since we both followed each other’s professional work for decades. We finally met and fished with Capt. John Harrell in the dory Gold Comet, and had a great time in Pacific City with John, his dad & mom Jack and Mary. Frank joined me fishing before he interviewed me about the books I’ve self published. The catching was as much fun as the fishing and Frank took home a cooler packed with sea bass fillets and cooked crab that he enjoyed and shared with his co-workers and friends. Frank, a respected book author and publisher, had taken note of my crazy assortment of self published books related to flyfishing, fly tying, and conservation, and asked to interview me as part of doing a review of my work. Wow, what an honor. Frank and I sat on the front porch of our family cabin at Pacific City and talked about our similar history in Oregon, and found we had far more to share than our time allowed. Thank you, Frank. The self-publishing world is tough, as is the traditional practice of book publishing. It is an unexpected blessing to have you find my work in the vast field of fishing related books and to take a liking to it. Lord where did the time go? Fishing for king salmon. Very demanding work but someone has to do it, right? Submitted content and original sketches to Frank Amato for publication in first quarter 2016 – On the Immorality of Indicator Fishing. This will be printed in Flyfishing and Tying Journal. Thanks for the opportunity Frank. Writing & editing next book. Tying flies to fish from day to day. Taught 2 classes on saltwater fly fishing at Watershed Fly Shop in home town. Wonderful people and a lot of fun. Fly tying demo and book signing at Royal Treatment Shop in West Linn. Joel always provides a warm welcome and there were a ton of very engaged people at the shop on a dark rainy day to watch and ask questions. I got a little over caffeinated and had a great time. Thanks to Rob and Erin for my lunch, if it were left to Joel I’d eat cookies all day long! My Rocky Mountain Trout Boat sank again in November. Sadness but no one hurt, and it’s only money right? Boat is retrieved, no serious damage to hull, but outboard is toast. Anyone want to buy a silted-up Yamaha 9.9 electric start motor as is (minus prop)? Three days devoted to cleaning the Den. Thinking about more books in 2016, undetermined at this time. I know there was more, but in the interest of keeping this update brief and moving on to more fly den tidying, I’ll call it good here. December 12th and 19th, I’ll be visiting with friends old and new the next two Saturdays at the Caddis Fly Shop. This will include my efforts to stuff my 2016 winter steelhead fly boxes, answering questions, and I dearly hope, signing a few books for folks shopping for themselves or friends. Thanks everyone, for your support and goodwill on and off the water.